At 3:05 this Saturday the curtain will come down on the career of arguably the greatest galloper in Australian racing history with WINX a $1.06 chance to win the Group 1 Queen Elizabeth Stakes at Randwick. If successful on Saturday, the Mighty Mare will finish with a world record 25 Group 1’s, 33 consecutive wins and career earnings of over $24 million. We look back at some of her most exciting performances at marvel at her achievements, It was difficult to just pick out five! WINX gave punters a taste of what was to come with a huge win in the Group 3 Sunshine Coast Guineas in May 2015. Coming from last at the turn, jockey Larry Cassidy took her to the outside of the track and rounded up her rivals effortlessly. Veteran racecaller Alan Thomas was concerned for favourite punters with 4oo to go. He need not have worried! Racing fans let out a collective groan when the mighty mare stood in the barriers and missed the start by over 4 lengths in the Group 2 Warwick Stakes when first up in 2017. Hugh Bowman kept a cool head. Winx worked into the race before driving late to claim stablemate Foxplay in the shadows of the post. Punters who took the $1.10 headed straight to the bar. With hindsight, this was the best chance her rivals had to beat the champ. The first of a record-breaking four consecutive wins in Australia’s premier Weight For Age race. Hugh Bowman took inside runs heading into the straight to power away from a star-studded field. The $4.60 was a generous price. At the time it was speculated that the ride flattered the winning margin. This was the beginning of “Winx Mania”! Winx was all the rage in betting heading into the 2017 Cox Plate, as she set out for a record-equalling third Cox Plate victory. Hugh Bowman asked the mare to make her move around the 600-metre mark and she travelled nicely into the race. Her main danger in the race, Humidor was perfectly ridden by Blake Shinn and looked like causing the upset of the century, peeling off her back with 100 metres to go. The Moonee Valley crowd let out a collective gasp. The superstar found under pressure. Elation and relief all at once. The connections of multiple Group 1 winner Happy Clapper are a rarity in Australian racing. Rather than avoid Winx, they are happy to race her with multiple minor placings behind the superstar. In the 2019 Chipping Norton Stakes, Happy Clapper was taken to the front by Blake Shinn in a bold attempt to defeat Winx. Happy Clapper ran arguably the best race of his career. Hugh Bowman didn’t let him get too far away from Winx as they entered the straight. Winx kicked into overdrive with 200 metres to go. It was Group 1 win number 23 for the Mighty Mare. 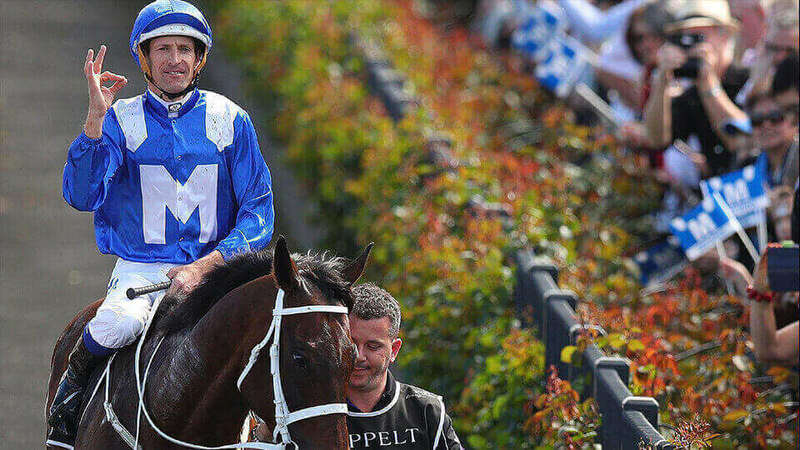 6 Jockeys have ridden Winx in races – Larry Cassidy, Tommy Berry, Jason Collett, James McDonald, Joao Moreira and Hugh Bowman. Joao “The Magic Man” Moreira is the only jockey to have ridden Winx and not have won on her (2nd in 2015 ATC Oaks). Winx longest winning odds was $6.50 (2014 Furious Stakes) and $1.05 (2019 George Ryder Stakes) the shortest. Larry Cassidy rode Winx once for a win (2015 Sunshine Coast Guineas) and later sold the saddle on ebay to pay for renovations to his backyard. Winx’s co-owner Debbie Kepitis father, Bob Ingham saw two of his star gallopers Octagonal(1997) and Lonhro (2004) defeated in their final runs.